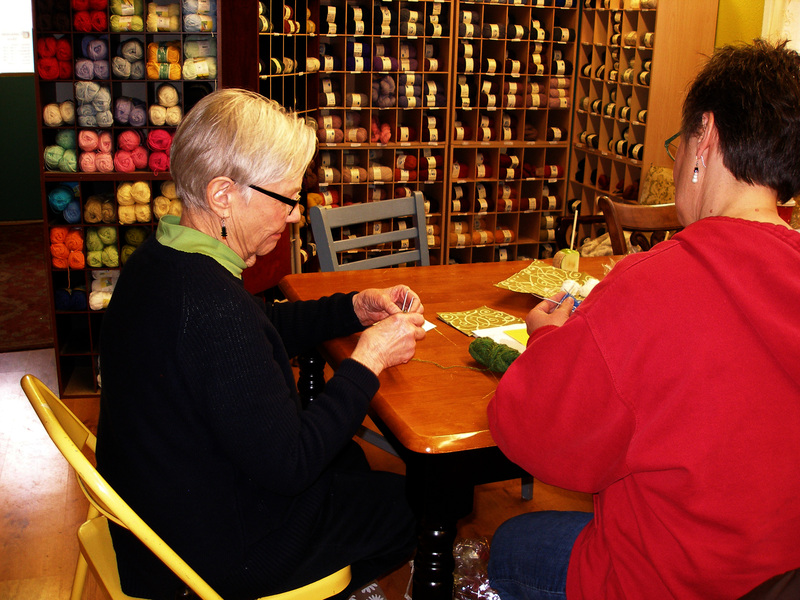 Every Saturday we gather at the shop for Open Knitting. Sometimes the groups are large, while at other times we have a smaller group. On a Saturday shortly before Christmas, there were about five us knitting and we started discussing knitted Christmas balls. One of the group members had never seen knitted Christmas balls, so it was decided that we should have a Saturday ball knitting party. Being so close to Christmas, I thought we could not get a Christmas ball knitted … and really there are plenty of patterns out there already for Christmas balls … so we thought we would have a New Year’s ball instead. 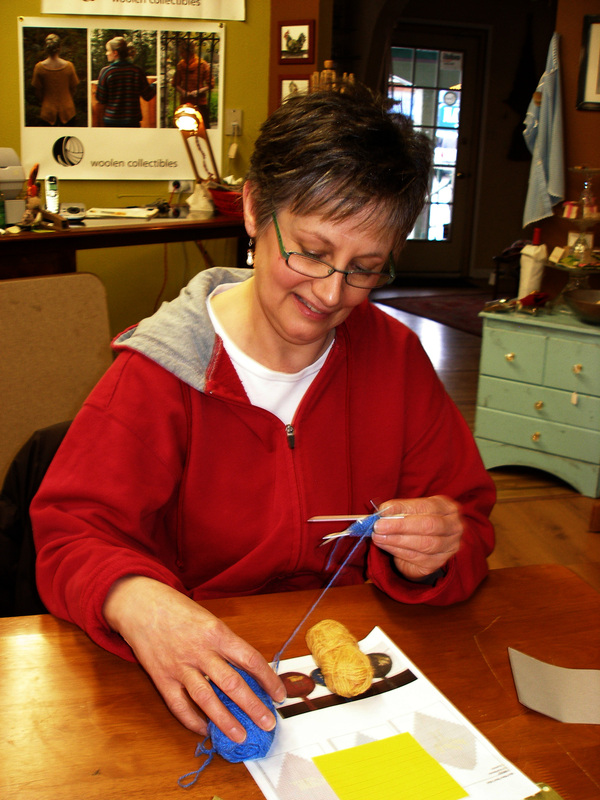 I designed three New Year’s balls and we all got together last Saturday hone our double-pointed, small needle skills. We start with very small needles and only five stitches. Robin is well on her way to mastering the New Year’s Ball. If you would like to knit one of these balls, the pattern can be found here: http://www.ravelry.com/patterns/library/nyb-01-new-years-balls. Last week, I needed a gift and quick. So, you know what that means … big needles and big yarn. Not my favorite, but it is certainly helpful at times like these. 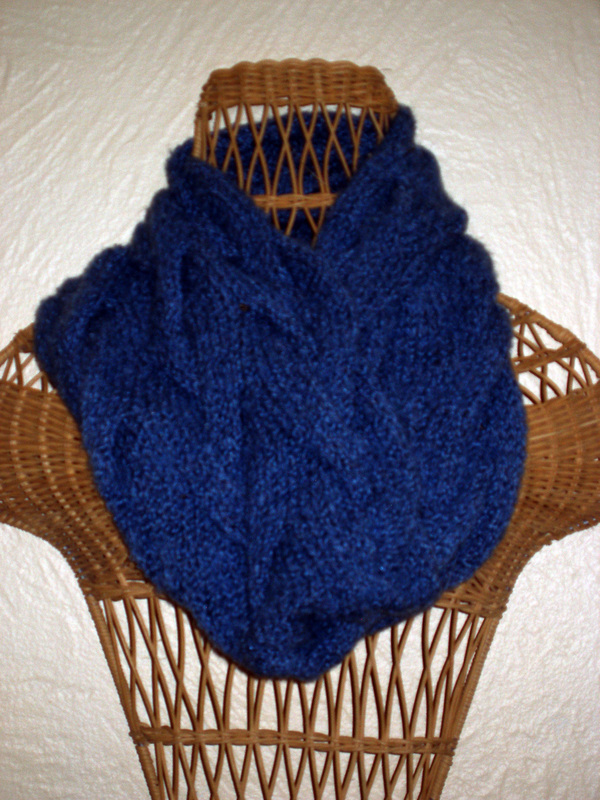 I chose to make a cowl with Nazca Wind yarn from Plymouth using size 10½ needles. I like Nazca Wind. It is a 77% Baby Alpaca, 18% Mulberry Silk and 5% Nylon boucle yarn with a soft hand. The cowl I designed is worked flat with a large cable design. I used an invisible cast-on, so I could have a seamless product in the end. 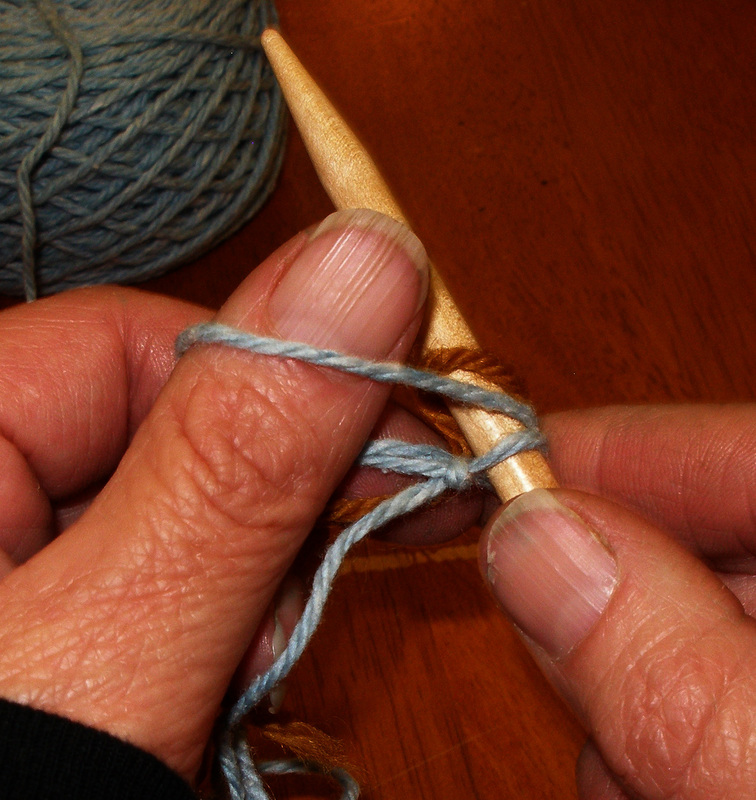 The invisible cast-on, or provisional cast-on as it is sometimes referred to, requires a length of waste yarn. I like to use cotton yarn that is of contrasting color to the yarn I am using, as it does not stick to the other fiber when you are taking it out in the end. For anyone not familiar with an invisible cast-on, here are the steps. Step 1: With waste yarn make a slip knot and place on needle. Step 2: Make the loop of your cast on with your waste yarn. Step 3: Wrap working yarn under needle. Step 4: Pass loop over tip of needle and pull tight. Working yarn is on the needle and waste yarn is holding the stitches. Stitches should appear like this. Note: When knitting your first row, you just drop off the waste yarn st. It is not worked as a stitch and not counted in the cast-on stitches. Here is the pattern for the Cowl I made. It took me two days of intense knitting. If you don’t have that kind of time to devote, I would plan on a week or so to complete it. Plymouth Nazca Wind (77% Baby Alpaca, 18% mulberry Silk, 5%Nylon; 142 yd/100 g): #7, 2 skeins. Size 10½ (6.5 mm): 16” circular (cir); Adjust needle sizes if necessary to obtain the correct gauge. 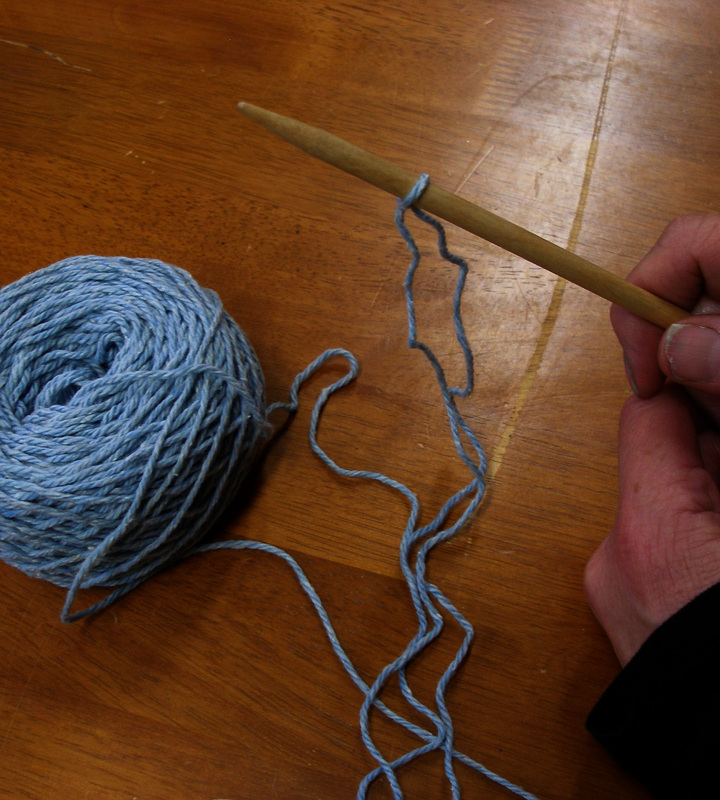 Markers (m); cable needle (cn); waste yarn cotton. 26 sts and 19 rows = 4” (10 cm) over chart on. Rnd 2 and all even rows: Purl. Rnd 3: K6, 6/6 LC. Rnd 5, 7, 9, 13, 15: Knit. Rnd 11: 6/6 RC, K6. CO 56 sts, sl 1, work patt st 3 times, ending with k1. Next row, sl 1, work patt st 3 times, k1. Work these 2 rows until piece measures 30″. Take out invisible CO and graft the two ends tog using the kitchener st (see instructions below). Weave in all ends and block. 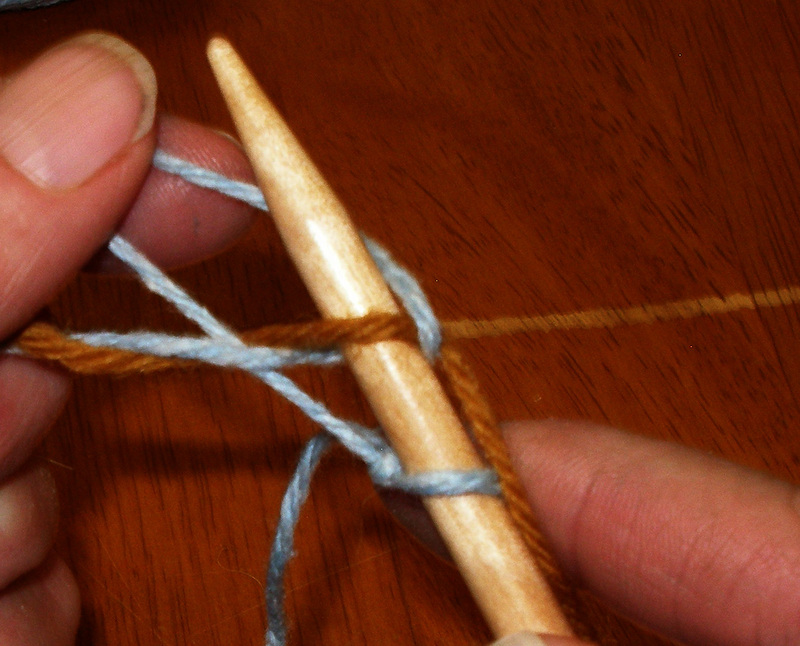 Place the stitches to be grafted on two needles and cut working yarn to a length about twice as long as the seam. 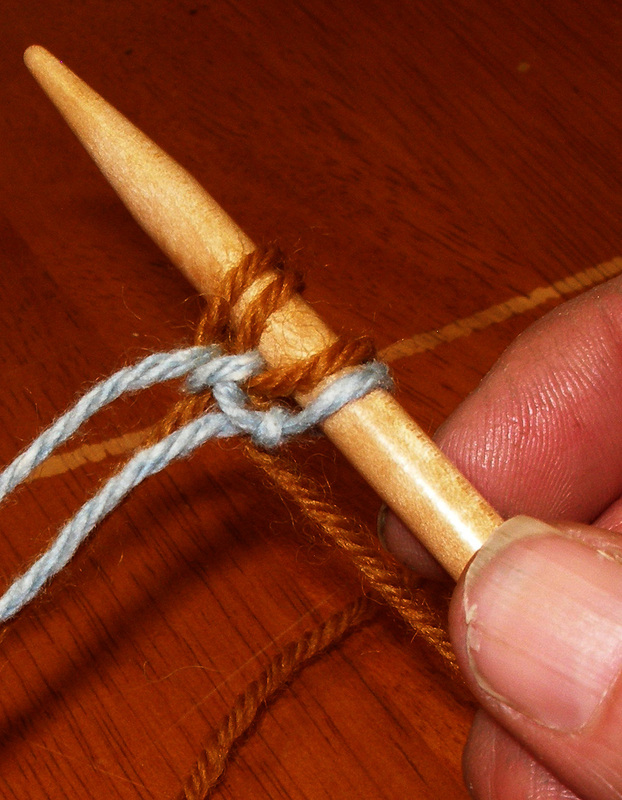 Thread tail onto a tapestry needle. 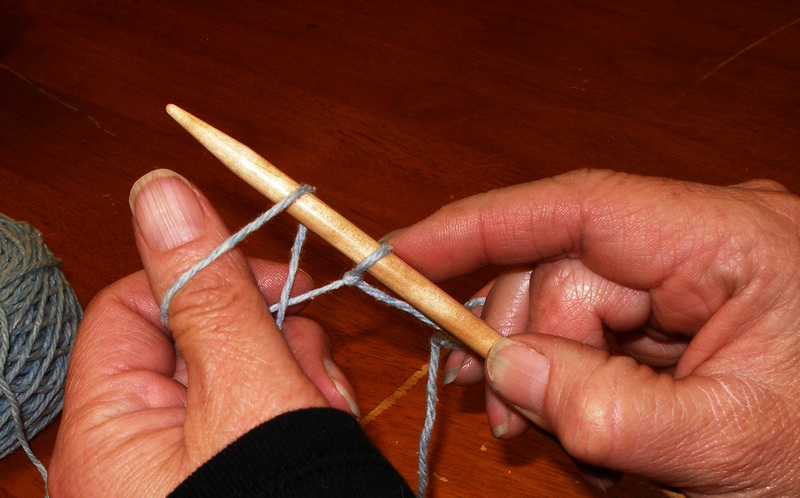 Hold the two needles in the left hand with WS tog; hold tapestry needle in the right hand. Step 1: Bring yarn through first st on front needle as if to purl and leave st on needle. Step 2: Bring yarn through first st on back needle as if to knit and leave st on needle. Step 3: Bring yarn through first st on front needle as if to knit and slip st off needle. Bring yarn through next st on front needle as if to purl and leave st on needle. Step 4: Bring yarn through first st on back needle as if to purl, sl st off, bring needle through next st on back needle as if to knit, leave st on needle. 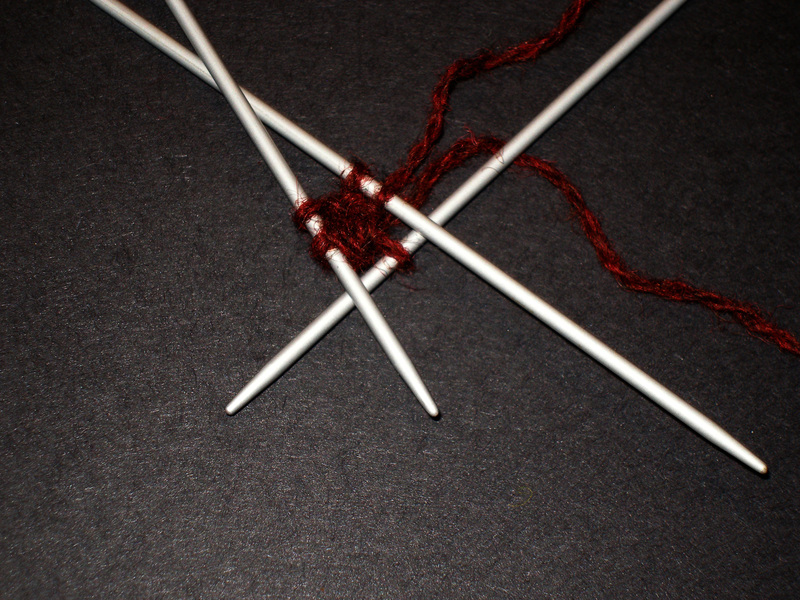 Rep steps 3 and 4 until no sts rem on needles, matching the tension of your knitting as best you can. Greetings and welcome to my first blog post. My name is Tammy Eigeman Thompson. I live in northwestern Montana and am a designer of knitwear. I gather inspiration for my designs from the gorgeous, rugged landscape of Montana. From the Big Sky to the smallest animal tracks, Montana provides an abundance of inspiration. I got my start by pure happenstance. My late husband Tony was exchanging tales with the proprietor of a local fly fishing store. The owner’s wife inquired if Tony knew of anyone who could hand knit sweaters for their store. Tony quickly ran out to our car to grab me…as I was naturally busily knitting away on my latest design… and from this rather unique beginning, Woolen Collectibles Design Studio was born. I have been designing and producing my own pattern lines since 1992. I have recently designed garments for Interweave Knits, the Exotic Fiber Group, the Bijou Yak Company, Zealana, and Mountain Meadows Yarns. So, what have I been doing lately? I just finished the December square for this year’s Square of the Month afghan. For the past several years, I have hosted a free cable afghan knit-along on Ravelry…the Square of the Month. Each month I post a new and unique cable square. Follow the knit-along for twelve months and you have a beautiful cable afghan at the end. Usually I select a 100% wool yarn for the afghan, but this year I chose “Bamboo Cotton 990.” The yarn is 51% organic cotton/49% rayon from bamboo. The hand of the yarn is absolutely wonderful. It is soft but really holds a cable well. It also has a slight sheen to it. I love this yarn! The other thing I did differently this year was to offer directions on knitting the afghan in strips as well as squares for those who wanted to cut back on the amount of sewing afterward. I don’t know about you, but when I get done with a project, I don’t want to still be looking at hours of sewing pieces together…I want to use it or wear it or snuggle up in it or whatever! Of course, the trade-off is that this method eliminates your ability to put the squares together however you want. December’s square, the pattern for which you can find on Ravelry at http://www.ravelry.com/patterns/library/december-square-of-the-month, consists of yarn overs, cables and moss stitch. I have found that you really need to keep track of the moss stitch — it is so easy to get off pattern and then you find yourself un-knitting, which is less then fun. I would suggest that with all of the squares you figure out how many rows it takes you to make 12″ and keep track of this somewhere so that you can repeat that number of rows for consistency between squares. It is a more foolproof method then measuring. With measuring we have a tendency to pull the piece, especially if we want the item to be finished. I have found keeping a row count invaluable in my knitting and I keep a notebook for notes like these on every project. It is good to be able to refer back to notes when needed. Having the same number of rows also makes sewing the squares, or the strips, together much easier because the stitches line up very nicely. If you are already “knitting along,” or if you aren’t and decide to join us, I hope you enjoy this square of the month. Happy knitting!